Land rolling has become a common soil-finishing practice for soybean in Minnesota and throughout the Upper Midwest. The practice has been used for decades in alfalfa and grass seed production to improve germination and manage rocks, but it is relatively new for row crops, where its main purpose is to improve harvesting efficiency and reduce combine damage. Figure 1. Rolling corn residue in a field ahead of planting soybeans. Large rolling drums are pulled across the soil in the spring, usually right before or after planting (Figure 1). The drums exert a packing force of about 3 pounds per square inch similar to the pressure exerted by planter closing wheels (source: Iowa State University). The practice prepares the field for harvesting by pushing small and medium-sized rocks down into the soil and crushing soil clods and corn rootballs. This allows the combine head to be set low to the ground, reducing the risk of picking up damaging rocks, rootballs and soil. Other benefits of soybean rolling include reduced operator fatigue, less down time and wear-and-tear on harvesting equipment, faster combine speeds, and cleaner seed at harvest. Land rolling does pose agronomic, economic, and environmental concerns. These include potential plant injury, soil sealing, erosion, the loosening of corn stalks and added expense. Understanding the advantages and disadvantages of land rolling will help farmers decide if - and when - rolling makes sense. Figure 2. Locations of the UMN Extension field scale research plots in Western Minnesota. Figure 3. A Flexi-coil packer was used at the two Wood Lake, Minnesota field-scale research locations. Figure 5. A smooth roller (like the Degelman pictured here) was used at 5 field-scale research locations in Minnesota. Land rollers range in size from 20 to 85 feet wide and have 2 to 3 1/2 foot diameters. Models are available with a single drum or several independently suspended sections. There are many types of land rollers, some with smooth drums and others with notched or coil-type drums. Figure 4. A Brillion notched roller was used at the Canby, Minnesota field-scale research location. University of Minnesota Extension trials (Figure 2) used several styles of land rollers on farmers' fields. These included: 1) a coil packer (Figure 3), which breaks up rootballs, leaving a rougher soil surface but does not push down rocks; 2) a notched roller (Figure 4), which pushes down rocks, breaks up corn rootballs and leaves a rough soil surface; and, 3) a smooth roller (Figure 5), which breaks up corn rootballs, pushes down rocks but leaves a very smooth soil surface. There was no significant difference in yield between the different rollers. During the three year study, there were no significant differences in stand, average yield, or seed quality among the treatments. The study also concluded that soybeans may be safely rolled up to the third trifoliate growth stage, or V3, when soybean plants are about 4-6 inches tall. Figure 6. Broken stem from rolling a soybean plant at the 3rd trifoliate stage. One of the most practical questions for farmers is "How late soybeans can be rolled without cutting into yield?" Rolling is usually done immediately before or after planting, but delays for wet weather or spring workload are common. In general, wheel tracks cause more plant damage to emerged soybeans than the rollers themselves. Soybeans rolled at V3 suffered significant plant damage at two of the four research sites in 2010 (Table 1, Figure 6). However, greater plant damage did not always reduce yields. Caution should be taken in wet years, where stem injuries caused by rolling could make plants more susceptible to soil-borne diseases. At two sites, rolling at V3 increased goose-necking and lodging. Table 1. Impact on plant population and injury when soybeans were rolled at different stages compared to non-rolled soybean in Minnesota. + In 2010, 2 of the 4 sites had significantly greater damage for the V3 trt. 2008 was visual observations only and are not included. 2009 is an average from 4 locations. 2010 is an average from 3 locations. University of Minnesota research found that rolling soybean pre-plant to V3 produced no significant yield or seed quality advantage to offset the cost of the operation (Table 2). Rolling at or after V3 is not recommended because of the increased potential to injure plants that could reduce yield under wetter growing conditions that were not observed in these studies. 2008 is an average from 2 locations. 2009 is an average from 4 locations. 2010 is an average from 3 locations. The Minnesota project was modeled after the initial research conducted by North Dakota State University in 2003-04. Iowa also conducted a two year soybean rolling research study initiated in 2009 (Table 3). All three efforts concluded that soybean can be safely rolled until V3 without significantly affecting yield. In the Iowa trials, rolling at the sixth-trifoliate stage caused severe plant damage and significantly reduced soybean yield by almost 10 bu/A. Table 3. Soybean yield in North Dakota and Iowa when soybean were rolled at different stages compared to non-rolled soybean. What happens to the soil surface and residue? One advantage to rolling residue is the flattening of stalks and breaking apart corn rootballs (Figure 7). Breaking apart residue and pushing it into the soil may help to speed up microbial decomposition. This could be used as a way to manage tough-to-breakdown residue especially in a reduced tillage system. Figure 8. Emerging soybean plant being protected by residue. Another added benefit to having moderate residue levels is its ability to protect emerging soybean plants from roller damage at later growth stages (Figure 8). Residue can support some of the weight of the roller, protecting the emerging cotyledon. When rolling after emergence, residue acts as a cushion to keep the plant from possibly bending to the breaking point when rolled. Figure 9. Drown out of young soybean plants due to rolling are shown on the right while the left rows were not rolled. The most serious environmental disadvantage of rolling is its effect on surface soil structure. Rolling crushes surface soil aggregates, increasing the potential for soil sealing, runoff, and erosion. For example, in 2008, a hard rain about the time of emergence caused ponding on rolled research plots at Canby in southwestern Minnesota, resulting in 95% reduction of stand (Figure 9). The problem was less severe on non-rolled plots resulting in only a 46% reduction of stand. To minimize this problem, leaving approximately 40% residue on the field will protect the otherwise exposed soil. Standing water between the rows of rolled plots after moderate to heavy rains has been observed in northern Iowa fields. This suggests that water infiltration may be slower in rolled fields. Reduced infiltration leads to more surface runoff after rainfall, contributes to soil and nutrient losses, and water pollution. In 2011, Iowa State University compared water infiltration in rolled and unrolled fields soon after rolling. Infiltration measurements were taken on Canisteo silty clay loam, Clarion loam, and Webster silty clay loam soils at four sites in northern Iowa. Although there was considerable variability, infiltration rates were generally lower in the rolled plots (Table 4). However, the differences were not statistically significant, except on the poorly-drained Webster silty clay loam soil. The researchers concluded that land rolling reduces water infiltration in poorly-drained soils. Figure 10. Rolled fields are more susceptible to wind erosion because rolling crushes surface soil aggregates and leaves the field smooth and flat. Rolling also increases the risk of both wind and water erosion, especially on susceptible soils or sloping terrain. After rolling, residue may come loose from the soil, reducing the soil conservation benefits of less tillage. There are many reported instances of blowing soil and residue after rolling (Figure 10). In parts of Minnesota, blowing corn residue after rolling can become a significant nuisance in fence lines, windbreaks, and road ditches. Table 4. The impact of rolling on water infiltration rates determined with a Cornell sprinkle infiltrometer at four sites with different soil properties in Iowa. 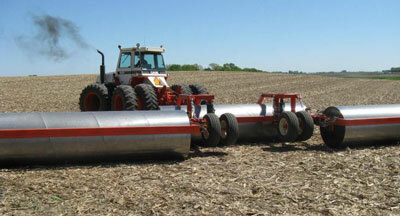 Roller rental expense in Minnesota for 2012 ranged from $3.00/acre to $5.00/acre, plus fuel and labor. Custom rates range from $4.00/acre to $12.50/acre, with an average cost of $7.25/acre, according to Iowa State University's 2012 custom rates survey. While rolling can make harvest easier, the economic benefits of rolling soybean are difficult to document. There is no doubt that harvest-ability is an important benefit to farmers, especially when working long hours and combining in darkness. However, it is difficult to put a precise dollar amount on the value of harvest ease. The improved harvesting conditions and peace of mind that rolling offers must be balanced with the damaging effects of rolling on soil quality and the additional expense. If soybeans have emerged, rolling should be done as early as possible (before the 3rd trifoliate stage) to minimize plant injury and allow more time for plant recovery. If you roll erosion-prone fields, roll before planting or wait until soybeans are in the 1st trifoliate stage. Erosion risk is the greatest right after planting. Do not roll when the soil surface is moist to reduce the risk of crusting or sealing and soil sticking to the roller. Avoid rolling when it's windy because residue can be moved easily to ditches and neighboring fields. Don't use rolling in an attempt to level soil ruts. We'd like to thank the Minnesota Soybean Research and Promotion Council, cooperating producers, crop consultants, and equipment representatives for their cooperation and support.